“The Greatest Showman” is an attempt to mount a big, brassy Broadway musical about the life of P.T. Barnum without the bother of actually opening on Broadway. Appearing with maximum razzle-dazzle in movie theaters this holiday season, it hopes to bottle the magic of a certain theatrical hit with less rapping and more Top 40-friendly tunes. Can’t mortgage the house to buy “Hamilton” tickets? Want a cheaper singing-and-dancing alternative set in a similar period New York? Step right up, folks; this way to the egress. The movie is earnest, enthusiastic, and relentless, and it’s put over by stars Hugh Jackman and Zac Efron in what constitutes a master class in jazz hands. It’s reasonably well made and will be an enormous hit, especially among young teenage girls and their families. There is nothing especially wrong with it other than that for some of us it represents 105 minutes in hell. To be fair, “The Greatest Showman” may eventually grow on the doubters, or beat them into submission. First, though, they’ll have to get past the opening sequences, in which a young, impoverished lad named Phineas T. Barnum (Ellis Rubin) woos and wins a little rich girl named Charity (Skylar Dunn) by singing a song called “A Million Dreams.” The song stops and starts through an endless montage in which the couple eventually age into Jackman and Michelle Williams, the latter contorting her delicate features into a rictus of happiness while they continue to sing “A Million Dreams” — Lord Almighty, is the entire movie going to be “A Million Dreams”? Thankfully, no. Burning to prove he’s as good as the toffs of early 19th-century New York, Phineas sinks his fortune and a little fraudulent collateral into a museum of wonders, which gathers dust until he rounds up such groundbreaking human novelties as General Tom Thumb (Sam Humphrey), bearded lady Lettie Lutz (Keala Settle), an African-American trapeze artist (Zendaya), and various tattooed and conjoined others. Manhattan society is scandalized, the more so when Barnum brings in spoiled upper-class playwright Phillip Carlyle (Efron) as his partner and ringmaster. In the process, the all-American arts of humbug, flimflammery, false advertising, and fake news are born. 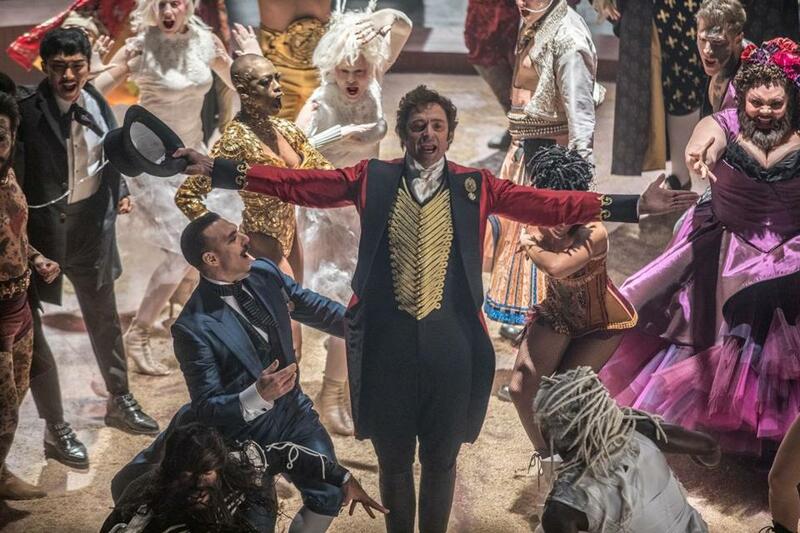 Broadway has had its way with this story before, with 1980’s “Barnum!,” but “The Greatest Showman” is aiming at a younger and more credulous audience that doesn’t care whether history gets sold out or if Jenny Lind (Rebecca Ferguson), the Swedish singing sensation Barnum brings to America, speaks with a British accent. (Nor did she try to steal him from Mrs. Barnum, but no matter.) Jackman and Efron are both trained singer-dancers — Williams does what she can to keep up — and first-time director Michael Gracey turns the production numbers into athletic workouts of camerawork, cutting, and choreography that every so often step back and simply let us watch people dance. There is a moment, though, when even an old crankypants might fall for this high-fructose nonsense. It’s the we-can’t-fall-in-love romantic ballad “Rewrite the Stars,” in which Efron’s Phillip and Zendaya’s Anne swoop in, up, around, and down an empty big top on various ropes and swings. The scene works because the filmmaking’s in synch with the song rather than editing against it, and because the visual arcs the couple make are pleasing to the eye, but mostly because Zendaya — charismatic yet unfussy, exotic yet down-to-earth — is the kind of natural born star in which the camera delights. Your kids already know this, as does anyone who saw her steal the last “Spider-Man” movie, but “The Greatest Showman” serves notice to the rest of the planet that the actress is ready for her close-up. Points, too, for casting Paul Sparks (“House of Cards,” “Boardwalk Empire”) as James Gordon Bennett, a humorless critic for the New York Herald and the hero’s chief nemesis. In reality, Barnum and Bennett were good friends, but every upbeat, toe-tapping success story needs a blackhearted naysayer or two. And, frankly, some of us are happy for the company. Directed by Michael Gracey. Written by Bill Condon and Jenny Bicks. Starring Hugh Jackman, Zac Efron, Michelle Williams, Rebecca Ferguson, Zendaya. At Boston Common, Fenway, suburbs. 105 minutes. PG (thematic elements including a brawl, digital circus animals).